Ambitious plans for one of Nairn’s most popular districts will go to public consultation after being considered by local councillors yesterday. 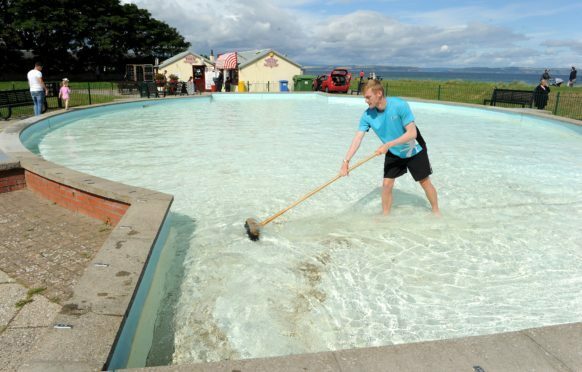 The future of Nairn Links came to the fore two years ago when its paddling pool was found to need significant repairs to stay open, and it was decided at that point to scope out the potential of the area as a whole. Now the paddling pool, described as an iconic part of the Links, has been envisaged as a water feature based on an installation of jets with coloured lighting. The neighbouring play area is up for a redesign incorporating seating and artwork. A boule court could complement the 18-hole putting and crazy golf course on the West Links, and more arts and entertainment events would be planned for the outdoor spaces. Ideas also include the possibility of developing a miniature railway, or land-based tourist train to take visitors to the beach area and round the Links, harbour, Viewfield and Fishertown. The development of enhanced coastal, seafront and town walks is also suggested, with more waymarking and a digital tour in podcast form. Beach huts are also in the frame, similar to those installed by a private developer at Findhorn. Nairn Links are an asset of the Common Good Fund, but managed by Highland Council. Ms Cowie added that development money had been earmarked in this year’s council budget anticipating the findings of the scoping report and “enabling a way forward for this important piece of work, recognising this is such a much- loved area by members of the community”. Councillor Liz MacDonald said: “The exciting thing about the report is there are opportunities to deliver on a good bit of it. “Take the harbour, fundraising from Team Hamish will help deliver the 20 new pontoons out there. Councillor Peter Saggers said that while there was pressure from some quarters to do things quickly, it was more important to get it right than do it quickly. The proposals will go out to consultation in August with a final plan ready next year.